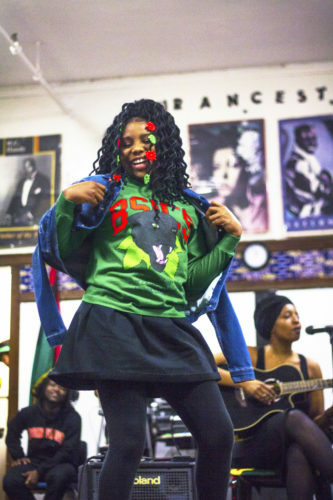 The second floor of Betty Shabazz International Charter School felt immediately familiar. Teenagers bounced between white tiled walls, in and out of classrooms, freely running through the long halls while parents passed by cradling younger children. Chairs lined the hallway in two rows, neatly crowding and condensing audience members as they waited to be admitted into the classroom where the We Real Cool fashion show would take place. As chatter filled the remaining space in the aisle, I tried to figure out why it felt like I had been here before. Like a home that makes you feel instantly comfortable, visiting Shabazz felt like returning rather than visiting. I was at Shabazz to cover the unveiling of the We Real Cool uniform initiative spearheaded by Desmond “DesMoney” Owusu, an alum of Shabazz, who is a mentor, part-time instructor, and designer. Uniforms are supposed to establish a sense of value and responsibility in students. But Des felt that uniforms often do the opposite and bore kids at best. Des launched the We Real Cool as a collaborative effort with students, with the goal of creating a uniform that engages students and helps them identify and connect with their peers. 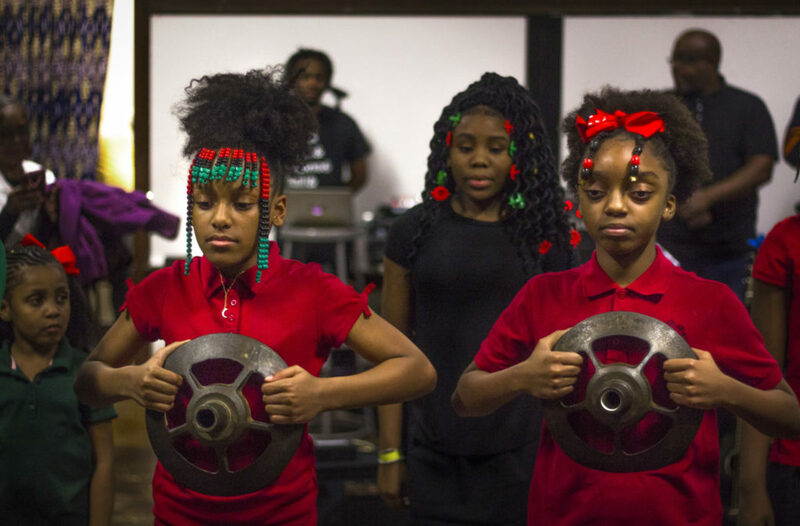 The We Real Cool project empowers students to shape their own future, the future of those around them, and the future of those that come after. As yet another kid flew past, it dawned on me: the post-school atmosphere of quiet. Those hours after the bustle of students rushing from class to class ebbs, leaving the calm of after-school nights. In those evenings, school always felt different—an older school building commands a different level of respect and freedom at night. Once the standard academic activities were done for the day, extracurricular activities began. As I watch kids set up for the show, I flash back to my days in high school and middle school, when clubs and teams captured my imagination. The anticipation of these activities helped motivate me though the academic day. As students stood, they asked the audience to stand just as they would for the Pledge of Allegiance. The students and parents of Shabazz recited the pledge in call-and-response form, and though the students were shorter than most in the room, their voices radiated confident and tall. Shortly after this pledge, the DJ announced that the fashion show was to begin momentarily. Onlookers peered towards the curtains as students emerged, first making a dramatic appearance from behind the curtain before strutting to the middle of the room, striking a pose, occasionally giggling, and then returning behind the curtains on the other side of the room. The students modeled new uniforms marked with phrases such as “Village kid!,” “WANG,” “In Memory of Mama Ann,” or the school’s initials “BSICS” in a bright and illuminating red. There were some ooo’s, some aaaa’s, and of course applause as each student showcased a new piece of the collection. 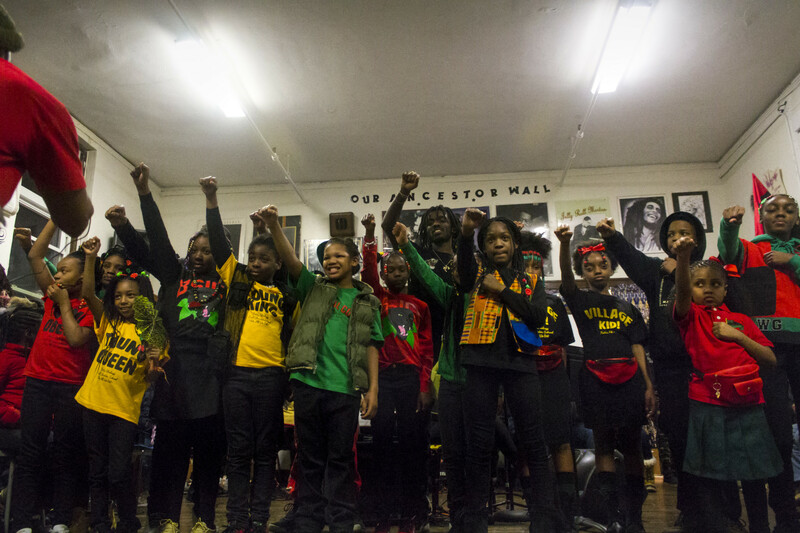 Displaying the traditional African colors of black, green, and red (symbolizing the people, the land, and the blood required for liberating struggle), the students stood tall, presenting the same level of confidence that they had when reciting the pledge. The night ended with a small speech from Des, acknowledging all the students, parents, participants, and audience members who contributed to this project. Des noted that the uniforms were already approved by Shabazz for next year—though they’re not all funded yet. The students who participated in the show came out and bowed, and the parents and younger children applauded. As a videographer who had been recording the performance asked students to pose for a final photo, I jumped into action, trying to get photos of the smiling and serious faces alike with their fists held high. As I moved around clicking my shutter button, I thought back to when I was in high school and how experiences like this encouraged me to be proud of my history, to follow my own passions in life, and to take charge in shaping what I wanted for myself in the future. For each of the students present, this evening would mean something different. Some would be startled by their own confidence, reciting the chant in front of the classroom. Some would leave empowered to shape their own future, instilled with the values and sense of responsibilities that educators like Des sought to ingrain in students. For others, this evening would affirm their own sense of self, pushing them to continue to be proud of who they are, what they do, and how they can help others see that too. To read more about the project, check out the op-ed Des wrote for the Weekly here, and to support, visit werealcool.us. Rod Sawyer is a photojournalist based on the South Side, focusing mainly on covering graffiti and mural art. He last wrote for the Weekly in February about Sanctuary murals within the Sanctuary Cafe.